An air-powered barrel bore cleaning system equally effective on smooth and rifled barrels from 25mm - 203mm. Fast, effective and one-man operation (labor saving) are the major advantages of this superior barrel management equipment. The Airnesco Bore Cleaning System (BCS) is a one-man operated pneumatically powered system that enables a soldier/operator to properly clean a large caliber weapon system in most cases in less than 5 minutes. As well as meeting these requirements, the BCS has been designed to be highly durable, simple to use, easy to store and it is virtually maintenance free. In many cases, it has far exceeded its design capabilities very successfully. TThe origin of the BCS was born from Airnesco's extensive industrial cleaning knowledge. Airnesco Group Ltd. In the UK developed a range of solutions for its Defense and Aerospace customers and after much trial and evaluation the Airnesco (BCS) was accepted into service with both the Royal Navy and British Army and has served all over the globe both on live operations as well as exercise. As well as seeing continued service within the United Kingdom, the BCS is employed with many Armed Forces across the globe and this number is growing every year. Airnesco's Defense Business Model is founded on the use of Military Knowledge, Industrial Experience and Global Partnerships. These three elements have enabled Airnesco to present a simple and highly effective tool to the modern battle field which time and time again proves its worth to Artillerymen, Gunners, Mortar men and operators of Armored Fighting Vehicles or any weapon launching systems wherever and whatever they may encounter. 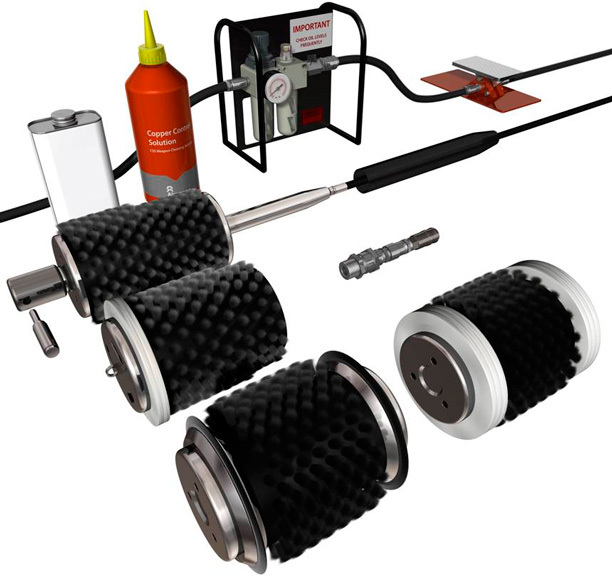 TThis system cleans and lubricates barrels between 25mm and 40mm in size. The filter lubricator can even be located in the lid of the container and a foot control valve is not required. A soft storage bag can be supplied as an alternative to a hard case and depending on the type of deposits found, a variety of brushes and accessories are available. 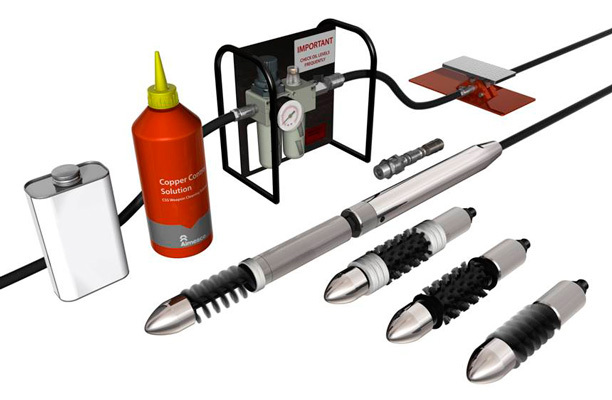 The picture below depicts a standard Barrel Cleaning kit, however contents can vary widely as each system is made to suit the customer's requirements. This system is available for larger barrels from the size of 57mm to 203mm. A free standing filter lubricator is supplied along with a foot control valve. A carry bag can be supplied as an alternative to a hard case and depending upon the type of deposits found, a large variety of brushes and accessories are available. The system only requires one operator and can be rapidly assembled and dismantled since it uses quick connect hose couplings throughout. The ferret can be placed into the barrel either breech or muzzle ends and it then travels along the barrel and on reaching the other end of the tube the brush direction is reversed and it returns down the barrel to the operator. The average cycle time is one minute for a double pass. The most received remark at actual demonstrations in the US has been "Man,that barrel looks brand new!!!"